Norwegian shipping and tank terminal company Odfjell SE announced on Thursday that it has finalized the sale of its tank terminal in Europe's largest port. The company announced in July that Odfjell Terminals entered into an agreement with Koole Terminals B.V. of the Netherlands to sell its 100 percent ownership of Odfjell Terminals Rotterdam in a move to help reduce debt. Odfjell said the sale has generated $100 million of cash proceeds. 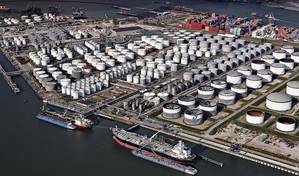 The terminal in the Port of Rotterdam has total storage capacity of 1,622,000 cbm in 270 tanks. It features five berths for deep-sea tankers with a maximum depth of 12 meters alongside, with seven positions for short-sea vessels and 14 positions for barges. An extended jetty to accomodate LR2 tankers is expected to become operational in the last quarter if 2018.